Save space in your warehouses! We buy back containers which you no longer need. Do you have storage materials which you no longer use (Europool containers, mesh containers, sheet metal containers, open base skips or tipping skips)? 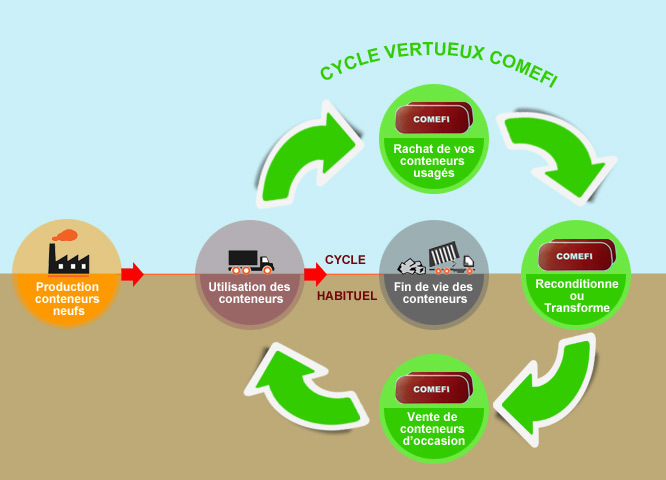 Aware of environmental issues, Comefi commits to a virtuous circle approach: refurbish and reuse. We will refurbish any containers we buy back. As a result we help reduce the environmental footprint of our industrial equipment. This approach is a mutually profitable system. You will also be part of the virtuous cycle and recycle your obsolete equipment..
Use the form below to receive an offer.